Since we announced this weekend that we are expecting baby number 6 in November, we have gotten a lot of questions. So, I decided the easiest way to answer them was here so all could read. 1. What kind of car do you have to drive with 6 kids? Well, we are looking at buying a used Passenger Van, like 12 or 15 passenger van. Yes, we will be driving one of those. No, we are not excited about the look of it all, but looks went out the window for vehicles a while back, now we are focused on space. I would be driving a Dodge Charger if I had my way, but alas, you cannot fit 6 kids in a Dodge Charger. So, if you know of anyone selling one of these monsters let us know. We are planning to buy one sometime this summer or fall. 2. Where will you put this baby in your house? Well, currently we live in a three bedroom house. We have one bedroom, the boys (4) have one bedroom, and our daughter has her own room. Initially we will have the baby sleep in our room. Once he/she gets too big for that, we will switch rooms with the boys, since our room is much bigger than theirs and the baby will sleep with them regardless of gender until he/she is about 5 years old. If it’s a boy then it will just stay with the boys, if it’s a girl it will room with our daughter. We don’t feel like our daughter, because of her challenges, can be trusted with the baby in her room until the child is old enough to defend themselves, about age 5 or so. 3. Was this a surprise? No, it was planned. I will say it happened faster than we expected, it usually takes us at least 6 months to get pregnant. 4. 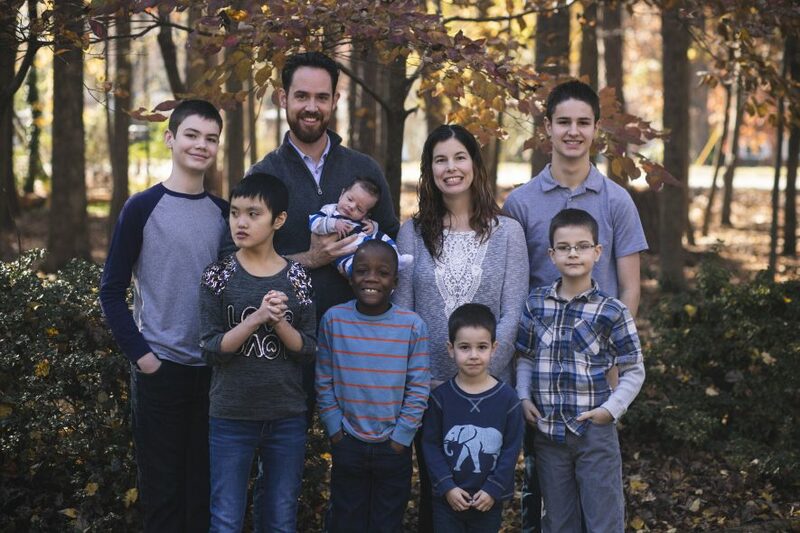 Why would you intentionally plan to have six kids? Well, we love kids, is the short answer. The longer answer is, God told us to. We had talked last summer about the possibility of someday, down the road, having one last baby. I felt like I might want to do that at some point, but not anytime soon. However, the night Elizabeth came home from Hong Kong I had a dream. It’s amazing because I only slept maybe two hours that night since she was so jet lagged, but never the less, I had a dream. The dream was that I found out I was pregnant a couple of months after she came home, and we were shocked. When I woke up, I thought it was pretty weird, but dreams are like that sometimes. The next night I dreamed of a little girl, she was standing in the middle of a room at a family party and I realized she was our daughter and I called her Abigail. This one weirded me out a little. You see, that very week I had been sent a book to review, I review books for a publishing company. The book was about how God speaks through dreams. Yeah, really. So, after praying about this whole thing I decided I would pray for a month about it and see if God was indeed saying anything through these dreams. I had another dream. Yep. In this dream we were at some friends house, who are about to have a baby this spring, in real life. They already have a son who is 3. So, it is Christmas time and they have two boys, one is 5 and the other 2. So, this would be Christmas two years from now. I was holding a one year old on my lap and he/she was my child. They looked just like Elijah, but I couldn’t tell if it was a boy or a girl, I just knew it was my child. So, after that, I decided that maybe God was trying to tell me something. So, I decided to tell God if he really wanted us to have another child he would have to speak to Glenn about it. I knew Glenn was not really open to the idea in the past, so I thought this would be a good test. So, I talked to Glenn about it and he immediately said he thought we should have another child. What? But we decided we would pray about it for another month. After the month went by we decided we felt God leading us to be open to having another one. We wouldn’t really try to have another, but just see what happened. That was 4 weeks ago, and here we are. So, we know God has led us to have this child and we are excited and hopeful that things will work out with this pregnancy. 5. Do you want a boy or a girl? Well, I would be lying if I said I didn’t want a girl, but of course boys are good too. I will go on record at this point and say my mother’s intuition is that it’s a girl, but you never know. 6. When do you go to the doctor? I actually went yesterday. They did a blood test and I am pregnant. My HCG was 988 which is on the high side of normal, that’s a good thing. They will repeat the test again this Friday and hopefully it will have gone up a certain percentage and that should tell us if the pregnancy is viable or not. Then next Thursday the 6th, our oldest son’s birthday, we will have our first ultrasound. It’s pretty early, but they are being very careful with this one since we have had two previous miscarriages. Thanks for all your support and congratulations. I know it as a shock to most people and we appreciate your kind words to us.